By far the coolest company I saw at JP Morgan last week was not even presenting at the conference: Proteus Biomedical and its “Digital Pills”. This company probably also had one of the best weeks of any company there: After I met with them on Monday, Proteus on Tuesday (Jan. 12) announced an agreement with Novartis and on Thursday (Jan. 14), this story entitled “Smart Pills” appeared in the Science & Technology section of The Economist. The immediate promise of “Digital Pills” is the ability they could confer to pharmaceutical companies to monitor patient compliance with medical regimens both during clinical trials and also after they are on the market. This might turn failed trials into successful ones e.g. if patients have been forgetful or medicines are less than good-tasting. The data from those patients could simply be dropped from the analysis and drug efficacy could be determined just on those who took the pills – a drug developer’s dream! And it might create a feedback loop between patient, physician and payer that alerts all of them when compliance is the cause of treatment failure rather than a lack of efficacy. Proteus also has a vision of “Digital Pills” taken by infirm or forgetful seniors alerting caregivers about their loved ones’ medication status. 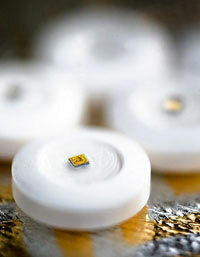 In contrast to the gold-plated technologies developed by many a medical device startup that increase the cost of care, “Digital Pills” can ultimately be very inexpensive. Thompson told the Wall Street Journal in August, 2009, that in high-volume production, the digestible digital transmitter will add less than a penny to the cost of a pill. Venture capital investors consulted by Boston Biotech Watch were a bit skeptical about whether this is a realistic estimate. If true, it could make “Digital Pills” one high-tech invention that could truly be aligned with health care reformers’ goals of smarter, more cost-effective healthcare. Proteus’ dynamic founder Thompson and his co-founder and company CTO Mark Zdeblick set out in 2001 toward a mind-bending goal: to implant a networked computer into a patient in order to improve medical treatment. In a burst of original thinking, Thompson realized that future medical products – even those as small as pills – would have their usefulness magnified if they were network-enabled. This required several technical breakthroughs. The company had to make sure that the “hardware” was also “wetware” e.g. that its sensor-transmitter chips would not be destroyed by stomach acid; devise a scheme to deliver short-range signals from inside the body to outside; and invent a “smart Band-Aid” that could relay these signals to a nearby handheld device (“medical BlackBerry”), which in turn could relay them to a server. The company had to come up with a chip built from food or at least materials that already qualified as GRAS [Generally Regarded As Safe]. The proprietary chips they invented, once activated by body fluids, can broadcast a pill-specific signal that says something like “I’m Lipitor, I was synthesized on Thursday, I contain so many milligrams of active material.” Then Proteus came up with sensor-receivers embedded in the “smart Band-Aids” to read these signals (e.g. via Bluetooth) and then transmit them on. According to the company web site, “Digital Pills” are in clinical trials in one indication area, heart failure. Furthermore, trials have begun of medical devices incorporating embedded technology from Proteus. These trials also are in the area of heart failure. Part of the magic of Proteus’ story lies in the backgrounds of its founders. CEO Thompson is a venture capitalist with Spring Ridge Ventures who successfully built and sold publicly traded medical device company FemRx to J & J in the 1990s. CTO Zdeblick spent part of his career in optoelectronics (with K2 Optronics) and part of it in creating “electro-fluidic integrated circuits” (with Redwood Microsystems.) He did PhD work in the lab of micro-mechanical systems pioneer Cal Quate at Stanford, where he invented a key part of the atom-manipulating atomic force microscope. Top-tier VC and private equity investors (see Table 1 for a list) have jumped on Proteus to the tune of a reported $100 million ($32 million in a 2008 Series D financing alone), providing a big cushion of capital to help push the technology to market. The Novartis deal is significant not just because, as The Economist points out, Novartis is the largest pharmaceutical company to form a partnership with Proteus, but also because it portends great future value in the company’s technology. To wit: for the $24 million in announced deal value, Novartis appears from the press release to receive worldwide commercial exclusivity to only one indication area, namely transplantation medicine, along with “certain option rights in cardiovascular and oncology product applications, as well as rights to use Proteus technologies in its clinical development of pharmaceutical products.” This last clause might be troublesome to Proteus in the event that it imposes limitations on the company’s ability to move forward simultaneously with clinical trials in many indication areas; on the other hand, Novartis is presumably paying for applied R&D that Proteus can later apply in collaborations in other therapeutic areas. Other “networked medicine” companies mentioned by The Economist (Boston-based privately held MicroCHIPS to the Netherlands-based multinational Philips are developing implantable devices for precise drug delivery and monitoring. There are yet others with transmitting ingestibles, such as Given Imaging, with its FDA-approved, wireless PillCam that views the GI tract from inside; and Remon Medical, acquired by Boston Scientific in 2007, which has worked on heart monitors for many years. But Proteus seems poised to be first-to-market with a truly transformative technology of low-added-cost, digitally enabled medications: Cool pills filled with promise. Disclosure: Proteus is not a client of CBT Advisors.